Opp() Former Tide head football coach Mike Dubose has decided to end his bid for a return to the sport in order to pursue 'other interests.' Dubose made the announcement during a visit to his old High School, describing the decision as a 'religious' experience. Apparently Dubose has decided on a career spreading the gospel from the comforts of his own home. 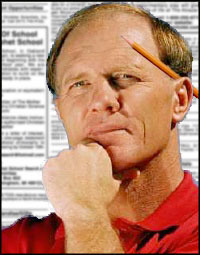 Dubose's scheme revolves around the placing of tiny classified ads in newspapers around the country. These ads will be simple inspirational sayings and various quotes from The Holy Bible. Dubose is convinced that a good deed done does not go unrewarded, and he anticipates receiving massive response to his ad campaign. "I don't know if I'm going to make any money doing this, but I think the more tiny classified ads I place the greater the potential benefit to myself and my family." Dubose was asked several times to explain how he expected to receive money from this new plan, but he was non-committal. "I expect people to feel good reading these ads. That is the primary goal of this project. If people also feel inspired to send money then I will have done them a service." But according to Dubose's own admission, these are going be 'tiny classified ads' and it is unclear whether or not there is room enough for Dubose to include his mailing address with each inspirational saying. 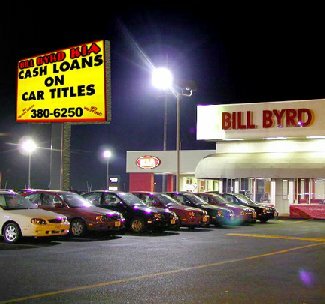 Hoover() Starting today, Bill Byrd Kia is offering title pawn services as part of the already ridiculously simple buying process. For over a year, the innovative dealer has offered financing to anyone with $199 and a job. But now all that is required is a job, because the $199 down payment can be recouped immediately by pawning the car title. "Come in, show your pay stub, and drive off in a brand new 2002 Kia Rio!" urged sales associate Skip Tracey, gesturing towards a row of gleaming fiberglass composite vehicles in various metallic colors. "As long as you make your monthly car payment [plus the title loan principal and 30% interest] no one will come to take your Kia away." Before now, Kia buyers lined up for services at dozens of mostly disreputable 'title pawn kings' that flourish in certain areas of the city. Bill Byrd will offer customers the same service, but with a trusted name and the added convenience of one stop buying and pawning. Bill Byrd is even keeping the title pawn service department open 24 hours since many customers are used to late night activities. Currently Bill Byrd is the only dealer offering this comprehensive purchasing and pawning plan, but other area dealers are said to have shown interest in the convenience for customers and the proven market for creative financing. Montgomery() During the gubernatorial debate on Monday night, Don Siegelman repeatedly tore into the Giant Corporation for causing Alabama's myriad budget problems. Accusing the Giant Corporation of dodging taxes and backing anti-reform legislation, Siegelman was relentless in his pursuit of what he termed 'accountability.' "No longer should the state be a prisoner of the Giant Corporation and the special interest," said Siegelman. "They continue to buy votes and keep the legislature from passing any kind of tax reform. They refuse to assume their fair share of the burden." The Giant Corporation, whose parent company (Royal Ahold) has several stores in north Alabama, was on the defensive even before the debate was over. 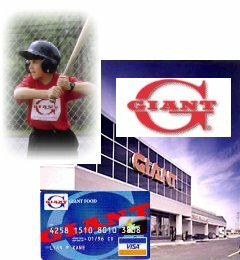 "We began receiving calls at our 24hr call center from irate voters threatening all sorts of action against us for keeping Alabama down for so long," said Giant Corporation president Grady Potenka. "Our call center has orders to contact me directly in case of emergency, and that's exactly what this was. Our legal department reviewed Governor Siegelman's allegations and decided to file suit immediately." The Giant Corporation suit challenges statements made by Siegelman as "baseless slander and outright lies about the integrity of our company." "We have always paid our fair share of state income taxes. We don't hide the fact that we do business in Alabama, and we don't have any lobbyists working for us in Montgomery," said Potenka. "Why doesn't Siegelman talk about the auto industry in this state? I don't think they have paid one dime in income taxes." The Siegelman camp did not respond to interview requests for this article. However, a public statement reiterates Siegelman's unwavering support for the state's giant automobile industry.